Happy Rogue Friday! Multiple retailers released their new merchandise bright and early this morning for Rogue One: A Star Wars Story, which debuts in theaters on December 16, 2016. 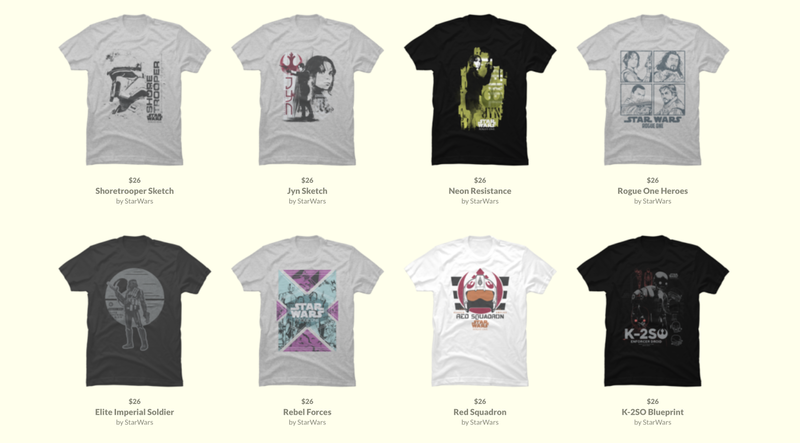 One of my favorite apparel brands, Design By Humans, unveiled their line of Rogue One shirts at midnight and I must say they look incredible! This collection features dozens of new shirts spotlighting all of the new characters from Rogue One including some of my personal favorites- Jyn Erso, K-2SO, Captain Cassian Andor, and Orson Krennic. You can proudly wear your heart (or alliance) on your sleeve by choosing a Rebellion tee or one featuring dark side characters like the elite Deathtroopers. Not only do these shirts look amazing with their subtle designs and earthy hues, but they are made to last. I have several tops from Design By Humans and they've lasted many trips through the washer and dryer while still looking brand new. Don't miss out on these officially licensed apparel items and take advantage of their free shipping offer for orders over $75.